Super Heroines 5! 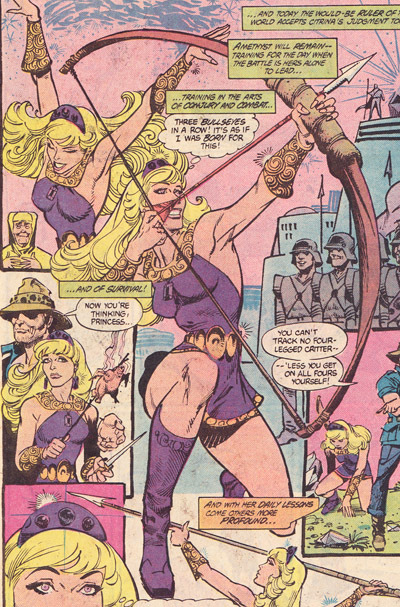 Amethyst: Princess of Gemworld (1983) and Ms. Marvel (2014)! (DC Comics, Volume 1, 1983-1984). Adolescence is difficult to write well. When we remember our own adolescence, we shudder, and the vibrations of that self-conscious shudder usually find their way into any fictional accounts of teenagerdom we craft, rendering them either several shades too snide or too maudlin. We think of ourselves as having been hopelessly naive and self-centered, all of the subtleties of our complicated emotional lives effaced by the sand blaster of adulthood and the slow erosion of time passed, and so we write adolescents as invariably insipid, gullible, and narcissistic. 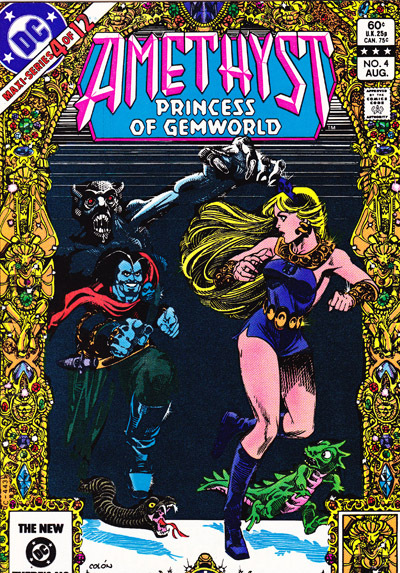 Comic books throughout the Seventies had their fair share of doltish teenagers but then, in 1983, came one of the loveliest accounts of the hopes and pressures of adolescence in, of all places, a fantasy comic book of the He-Man stripe, Amethyst: Princess of Gemworld. It’s the tale of Amy Winton, a thirteen-year old girl who is given a gem on her birthday that opens a gateway to Gemworld. Stepping through, she finds a world of magic users and fantastic creatures and, much more than that, that she is now a grown woman, the Princess Amethyst, upon whose shoulders rest the entire realm’s hopes for survival. The Royal Parents theme is evident from page one. It is, quite consciously, an exercise in the Royal Parents trope (which is referenced in the first lines of exposition), the fantasy that one’s parents are fakes, and that one’s real parents are extraordinary kings or wizards who will one day come and reclaim you as their own. I think we all had that daydream at one time or another, and Amethyst is a sustained working-through of that childhood constant. 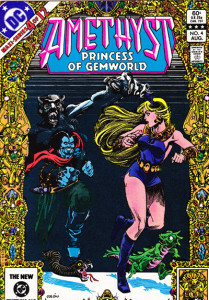 As Amethyst, Amy must reunite the various lands of Gemworld which have been under the tyrannical boot of Lord Opal since the murder of Amy’s real parents some two decades past (time moves more quickly in Gemworld than on Earth, which is why Amy has an adult form in one world and an adolescent form in the other). Meanwhile, at home, she’s a regular girl with two deeply realized characters for parents. Her mother is a child psychologist and her father a professor, and their interactions with Amy are among the smartest and most real-feeling human interactions of any comic. The episodes on Earth are few, however, as this is really the story of Amethyst learning to lead, to bury doubt so that the nations looking up to her take inspiration and fight on. More than a story about fighting and magic spells, it’s a story about the magnetic strength of independence, a message that any girl growing up in the early Eighties surely needed for the hard road ahead. It is also a tale of the confusion of approaching maturity. Amethyst is a thirteen year old in the body of a twenty year old, and must process at once the flood of other men’s desire and the sudden onset of her own. It’s an analogy for adolescence generally – feeling your body and mind tugging in different directions, as idealized middle school romance runs hard against the realities of maturity. Having Amethyst, as a grown up, confronting the passions of the adult world with the consciousness of an adolescent, gives the young readers a handle on something hard to understand, and is an engaging way to remind us older readers about the stumbling complexity of those years. The page layouts are pure fun. Amethyst is, in short, a beautifully told, vibrantly drawn tale with a psychologically subtle underpinning easy to miss if one focuses only on the superficial similarities with Masters of the Universe or She-Ra. It has some of the best parent writing in the business, and has found some enchanting ways of dealing with the hope and confusion of growing up, all while telling a great and fun story of evil overcome. 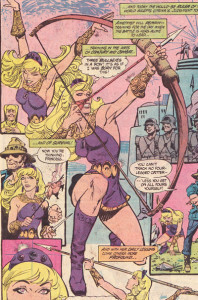 Fierce: 9: Amethyst has various magical abilities, but the true fierceness of the character comes from her assuming the mantle of leadership and learning how to inspire, and how to deal with advice from elders in a way that incorporates their information while retaining her full authority. Smart: 9: Amethyst never does anything particularly brainy, but her diplomatic intelligence is keen, and the emotional intelligence of the book overall is fantastic. Funny: N/A: This book doesn’t try to tell any jokes which I find a great improvement over the early 80’s propensity to tell lots of terrible jokes. Artwork: 9: The gem-theme is played out throughout the artwork, with the vibrant colors of the various world gems a component of the page designs, and the creatures and mythology of the realm woven into the inter-panel elements. The scripts call for some complex emotions to be rendered, and Colón regularly succeeds in finding the proper tone. There isn’t anything particularly revolutionary in the character design, but there isn’t anything unusually offensive either. Artists: Adrian Alphona, Jacob Wyatt, Takeshi Miyazawa, Elmo Bondoc, Ian Herring. 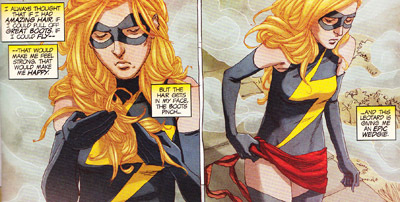 Few titles have had as many hopes and expectations greet their inaugural issue as faced Ms. Marvel upon its launch in 2014. It was the comic that was going to heal social wounds and shove comics into a bold new era of subtly managed inclusivity. It was destined to pave the way for quirky female super heroes and gifted female writers and, if the hyperbolic speculations were to be believed, more or less solve racism and chauvinism in the comics industry and thereby, clearly, the world. 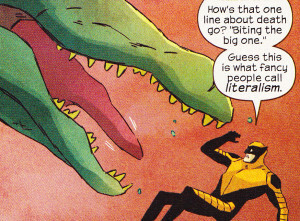 It was a massive weight to place on a book with a new creative team and a new character, and so come that first Wednesday the tribal elder wisdom held that the bubble of over-inflated praise would burst, and Ms. Marvel would go the way of so many promising but under-supported Marvel super heroine titles before. Then the amazing thing happened- an armada of long-standing comics nerds and first-timers picked up Issue One, thumbed through it, and found that it was not what they expected, but was precisely what they wanted. Ms. Marvel is the story of Kamala Khan, a Pakistani Muslim teenager dealing with the everyday grind of Being Different. She is a fan-fic writing, Warcraft playing, good grade getting nerd who has to put up with Caucasian Sympathy and Concern, which Wilson portrays very believably as far more dehumanizing than workaday scorn. Her family consists of likable and relatable people who, yes, represent various stereotypes of the Indian Subcontinent Family trope, but do so in a way which shows a basic humanity that just about anybody can connect with. Family Dialogue is a clear strong suit of the comic. The scenes with the family are, truth be told, my favorite part of this comic. The tension between assimilation and tradition, identity and duty, is the keen pulse running throughout the book, creating an emotionally resonant foundation to which the story can constantly return when the super heroics are in danger of going stale. In terms of the domestic sphere, this is one of the most consistently engaging comics out there. When the book moves away from the sphere of Kamala’s family, the results are more variable. The teenager patter is filled with references to 80s movies, MMORPGS, and early-season Simpsons episodes, which is how people in their thirties think teenagers talk, but resolutely is not how teenagers talk. I know that we all want to think that the pop culture of our youth is eternally young, but as I have discovered over years of teaching teenagers, observing Marty McFly and Princess Bride references meet with a total lack of recognition, it isn’t so. We don’t have a claim on youth culture in perpetuity, and it’s sadly time to stop writing adolescents as if we do. Kamala’s first transformation is a poignant moment of double alienation. The super antics side of the equation features a mixture of quite lovely things, and well-intentioned things that didn’t quite work as planned. The story around the first villain, a clone of Thomas Edison who is part cockatiel, started off promisingly enough, but didn’t quite manage to sustain its thematic elements. The impact of his storyline rests on us believing that a Clearly Evil cockatiel headed man approached a bunch of pretty regular teenagers and said, “You are parasites, and can best serve the salvation of the world by becoming human batteries for a series of gigantic robots I’m building,” and that they then responded with, “Yeah, that sounds about right, we’re in.” This is supposed to make the teenage volunteers seem selfless and thereby feed into the overarching notion of modern youth as service-oriented rather than social-media-obsessed. It’s a good message that needs to be said more, but the lead-up is all so improbable that one is too busy wincing at the awkward justifications to work up a respect for their noble motivations. That awkwardness weaves its way through the climax of the first arc, and hobbles somewhat the impact of Wilson’s moral. On the super hero side, things are better. A team-up with Wolverine strikes the right balance of experience confronting youth, and the interactions with the Inhumans whose Mists gave Kamala her powers reinforces nicely the themes of assimilation running throughout the comic. Plus, the fist fights incorporating Kamala’s morphogenic powers are super fun visually. But super heroics isn’t what this book emphasizes at its core. It’s about a girl dealing with difference and adolescence. She’s an Inhuman (a subject of Queen Medusa, who is for some reason always drawn as if she’s seventeen), a Muslim (which doesn’t make a terrible amount of sense given the existence of alien races and scripture-debunking time travel, but we’ll leave that be), a Pakistani, and, worst of all, a teenager, trying to figure out how things like boyfriends and heroism work. In one of the most telling episodes of the early issues, her first transformation causes her to become the white-skinned, blond haired, sexified Ms. Marvel of the early 2000’s, a desperate manifestation of a desire to fit in rendered external by her unconscious morphogenic gifts. She doesn’t have all the answers right away, and her openness to wisdom from unexpected sources is one of the continuing delights of this book, as is her nerd’s eye perspective of the world she’s stepped into. So long as Ms. Marvel avoids being dragged into mindless crossover events that emphasis galactic punchery over domestic difficulties, it will continue to be one of the great and unique accounts of foreignness in all of its manifestations on the comic shelves. Sing Me a Meter of Power, Oh Screen. Fierce: 8: Kamala can handle herself nicely in a fight, relishing her powers with a refreshing zest that breaks up the episodes of social doubt, and has shown an increasing concern about the lethal boundaries of her powers that should lead to interesting places. 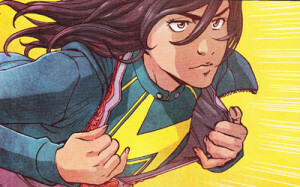 Smart: 7: Kamala Khan is supposed to be a perfect student, and yet, every time she says something physics-related to demonstrate that intelligence, it’s mostly wrong (an early reference to Newton’s Second Law is particularly cringe-worthy), though in a way that I suppose is in character for a high school student. Keep in mind though that, as a physics teacher in respectable life, I’m probably pickier on that front than I need to be. The cultural intelligence, however, is acute and refreshing. Funny: 8: Again, you have to suspend your disbelief that a girl in her teens jokes more or less exactly like a person in their thirties, but when you do, the references are great and fun. Artwork: 9: This is a magnificent pairing of art and narrative. There are several different artists throughout the first 14 issues, but they all stay true to Alphona’s initial vibe, a mixture of the cartoony and the fragile, a perfect representation of Kamala’s romanticized inner life sliced through here and there by veins of sadness and frustration. Bookmark this article Super Heroines 5! 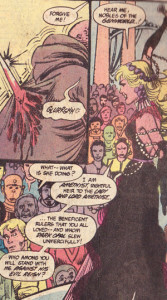 Amethyst: Princess of Gemworld (1983) and Ms. Marvel (2014)! Super Heroines 4! Jetta (1952) and Batgirl (2011)! 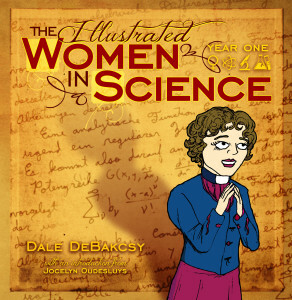 New Women in Science! Florence Sabin!